A templated class to allow one to wrap a CPU operator as a CUDA operator. This class can be used when one does not have the CUDA implementation ready yet for an operator. Essentially, what this op does is to automatically deal with data copy for you. Plausibly, this causes a lot of overhead and is not optimal, so you should use this operator mostly for quick prototyping purpose. Example usage: if you have a class MyMagicOp that is CPU based, and you use the registration code REGISTER_CPU_OPERATOR(MyMagic, MyMagicOp); to register the CPU side, you can create its corresponding GPU operator (with performance hits of course) via REGISTER_CUDA_OPERATOR(MyMagic, GPUFallbackOp); Note that you will need to make sure that the operators actually share the same name. 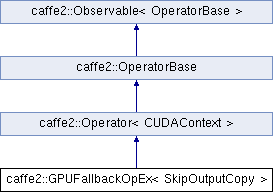 Definition at line 42 of file operator_fallback_gpu.h.